Given today’s images of modern Iraq it is hard to believe the original Garden of Eden lay at the headwaters of the Tigris and Euphrates in ancient Mesopotamia, from which the new nation sprang. Genesis aside, it is a brave person today who dare call the country a paradise on earth. Yet Violette Shamash thought so when she was young, living with her brother and sisters on the banks of the Tigris in a “palace” built by their father. 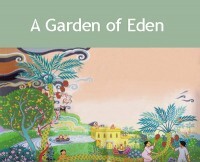 In Memories of Eden she describes a place where the diverse communities lived together in peace, and religious differences were respected. Among them was one group that could truly claim to be indigenous, as their ancestors had been brought into exile there a thousand years before Muslims arrived with the Arabic-Islamic conquest: the Jews. Their long and proud history meant that they were treated as equals, enjoying a way of life that hardly differed from ancient times. 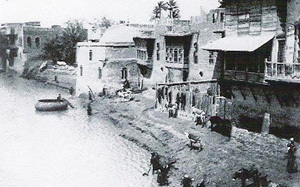 Violette’s family home was a two-storey qasr, a villa occupying a dominant position on the riverbank in the Karrada district of Baghdad, one of the first stone-and-brick houses in the neighbourhood, which in those days was almost all agricultural land, unfenced plots without any obvious demarcation or concerns about security. One can tell how important the house must have been: the only other one to stand out belonged to the Naqiib, the Sunni holy man who became crucial to the future of Iraq as prime minister in 1921. His riverbank home occupied a small promontory, and it was there in 1922 that he signed into law the treaty underpinning the British Mandate under King Faisal, the monarch installed by Britain to rule the new country. By Violette’s own account, the king himself had designs on her father’s qasr, and called on the family with the intention of buying it. But it was not for sale. Violette’s account of life in Baghdad until the Farhud pogrom of 1941 is a rare social history of the time and place written in entertaining detail – and for the first time, by a woman. It touches on superstitions, matchmaking, rudimentary healthcare and even the jokes that were current at the time. Although it delves deeply into the daily life and domestic issues affecting the Jewish community (two-fifths of the population during World War One) its appeal transcends religious divides. It is a bittersweet story, a shared emotion, based on letters and notes she sent to her daughter, Mira, over a period of more than 20 years. 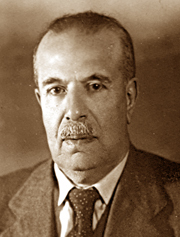 Father, (“Baba”), was the merchant banker Menashe Ishayek, a passionate gardener who created a botanical paradise in a land where water and heat were everyone’s daily preoccupation. He faced considerable odds. Summers were long and scorching, with temperatures reaching 54 degrees Celsius (130F). Water came from a fickle source: the river itself, in flood one minute, low and scummy the next, ripe with dead fish and bloated animal carcasses. From March to May in “the land between the rivers” both the Tigris and its twin swelled with melting snow from mountains in Turkey and Iraq’s northern regions, accounting for more than half their annual flow. This caused perpetual flooding problems and consequent loss of life, from drowning or outbreaks of cholera. It gnawed away at the land, so the first priority was to shore things up with whatever was available – in the first instance, bundles of firewood which he embedded in the mud. When this didn’t work, more elaborate solutions were tried, eventually leading the determined man to create a reinforced concrete dyke with a flight of 25 steps to give access to the water. Naturally, everything depended on irrigation, yet they had no running water. 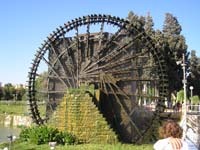 Next to them lived a Muslim who owned a noria watermill made of perpendicular wheels driven by an ox with a man guiding it to draw water from the river. The water went from one bucket to the next before the load emptied into the man-made channel in his orchard. So in the beginning, Baba struck a deal whereby the stream would be diverted into his fledgling garden for part of each day. 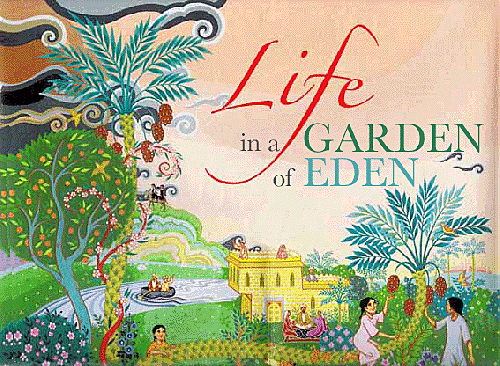 As time went by and the garden developed, he created his own intricate system of irrigation channels and sluices that were connected by a narrow stream that watered everything. It had to be fed, laboriously, by a man who drove two oxen hauling huge buckets up the sloping ground from the river, day in, day out. The oxen were roped together in such a way that when one was at the top and the man could empty its bucket into the first sluice, the other was at the bottom and his assistant would fill it up. For young Violette and her six siblings it was bliss: it felt so good to go barefoot in the stream on hot days, with the water right up to their knees when they were little. But for Baba the master planner, and Djassem, his gardener and weight-lifter, the watercourse was the key to his grand design. He divided it, and through the centre created a long path known as the maderban, wide enough for three people, running right through the garden, sharply edged on either side by the narrow water channels. To begin with, this religious man – his grandfather was a rabbi, and he held an important place in the large Jewish community of the time – was mindful not to “work” on the Sabbath. He avoided even strolling in the garden on his day off, lest he step on a twig and break it. But his passion got the better of him and he soon gave up worrying, so his wife and children could enjoy the fruits of his labour together whenever they wished. Any garden in Baghdad had to be useful as well as ornamental because of the difficulties associated with keeping food in such a hot climate. Self-sufficiency was the goal, and growing their own was the best way of ensuring they ate only the freshest produce. So it would have surprised nobody to see, on arrival at the qasr, two cows and their calves tethered under a high trellis laden with grapes or the chicken coop and the cattle’s winter accommodation. All the same, it quickly became clear something extraordinary was emerging from the muddy outcrop by the side of the Tigris. People soon realised the family had an exotic garden, which was behind the house as you looked at it from the river. First, that large pergola heavy with assorted grapes: it was clever, as it gave ample shade to laze under in the summer, and in the cold months the vines lost their leaves and let the sun shine through in winter. Gardenias and jasmine planted nearby produced a heady perfume as you lazed. Then, all along the maderban many different sorts of citrus trees were growing, with the other fruit trees behind them – eventually, just about everything: apricots, peaches, plums, cherries, mulberries, figs, pomegranates, apples and pears and exotic fruits such as lotus berries (hackberries) – deliciously scented, red and yellow – and bananas, until then unknown in Iraq. There were nut trees: walnuts, almonds, hazelnuts and a real rarity, a pistachio tree. There were haphazard patches of vegetables – tomatoes, cucumbers, aubergines, courgettes and so on – and several tenacious plants like mint and pepper as well as flowers such as violets and hyacinths, growing wild. There was no purposeful symmetry anywhere. 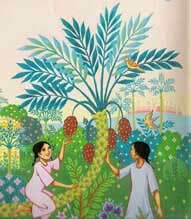 Flowers and vegetables grew between the fruit trees which in turn grew between date palms. It must have been truly wonderful to wander round and pick fruit of different textures, flavours and tastes, and as always, the younger generation went for the green, unripe ones, to its cost. “We children thought we were in paradise. We had three nabqaayi trees bearing lotus berries, one just outside the house and two further away.We all loved the khastaweeyah date palm by the pathway. It was the ideal tree: big, fat, shady and easy to climb. dates and pick them by ourselves. almonds and walnuts, too. Walnuts were especially prized by us sisters: just before the nut ripened, before the kernel became hard, its juice made an indelible dark brown stain that we applied to our lips like lipstick (which wasn’t to appear in Baghdad until the end of the 1920s). Highlight of the year for the girls was the time they made orange-blossom and rose water for their cook (flavourings for desserts and pastries) as well as their toilette. In order to distill the blossom of the Seville orange trees and petals of some special pink roses Baba planted, a man arrived with an alembic still aboard his guffa – a round black boat shaped like a giant car tyre, made of wicker covered with bitumen, the type of coracle that had been in use for paddling goods and people up and down since the days of Noah. While he set up shop, Djassem, together with his wife, Fatoom, and anyone else who cared to join in would shake the orange flowers off the trees and place them in the still with some water and start to warm the mixture. As it was coming to the boil, the distiller connected a pipe, and the vapour condensed as it passed through and cooled, dripping into a bottle. The roses then underwent the same treatment. Now it is time that has vaporised, and all that are left are the memories Violette has distilled into her book, which is not only a remembrance of a legacy lost in time but “a treasure house of information” according to Professor Shmuel Moreh of the Hebrew University. “The story is full of detail: the heat, the holy days, the rituals, the food; the smells and sounds of the souq; the river, its water and fish; the costumes and clothes people wore; schooldays and rides on donkey-back before motorised transport became available,” he says in a Foreword. Of course it was too good to last. Everything came crashing to a halt after Iraq gained independence, slipped into the hands of Nazi sympathisers, and in 1941 the earthly paradise exploded in the Farhud, which echoed Kristallnacht – two days of mob violence and rioting while British troops stood by, under orders not to intervene. 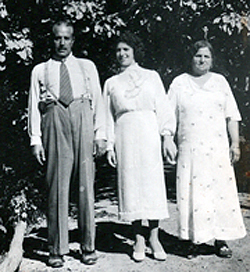 History has all but forgotten the tragedy, in which more than 180 Jews were killed, though it sounded the death-knell for the oldest community in the Diaspora and resulted in Violette and her young family leaving Iraq forever. The Jews of Iraq later dispersed to the four corners of the world; the gardens are no more. 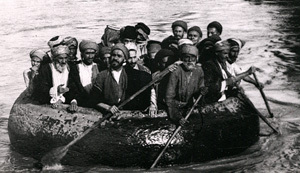 Eventually Baba and his family left Baghdad like the rest of the community, and spent the rest of his life in Israel. 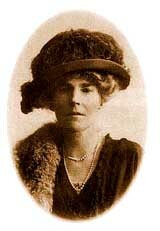 Violette and her family came to London in 1964, where she died two years ago. The qasr was demolished and is today the site of a modern hotel, directly across the river from the US Green Zone. There is not a flower in sight. There was only one way to go — NAIR-RENN! 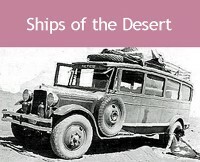 By the 1930s, crossing the vast Syrian desert to and from Baghdad had become quite commonplace, on routes well established. The Nairn Transport Company, begun by two brothers from New Zealand who had been serving with the British army, had been an instant success, and “Nair-renn” became part of the vocabulary – not only in Baghdad but throughout the Middle East. The Nairn coaches opened possibilities beyond the wildest dreams of Violette and her sisters (one of whom, Fahima, is seen here enroute to Palestine in 1931). Compared with the days when camels were the only ships of the desert, it was a relatively fast trip from Baghdad to Damascus, or Beirut or Haifa. From there it was possible to take a train to Egypt or Turkey, or board a boat for Europe — or even America. This article from Saudi Aramco World magazine tells us more about The Nairn Way. By the 1920s, modern shops began to appear in Baghdad and, as Violette recalls, they even had that ultimate luxury: the department store. Mention the name Orosdi Back, and Iraqis of the older generation fondly remember the unheard of style and daring Western chic it brought to their erstwhile unadventurous lives with its luxurious commodities, fashions, novelties and — above all — the grandeur of what today we would call the shopping experience. It was the Harrods, or Bloomingdale’s, of its day, complete with gilded fascias, plate-glass windows and one astonishing feature never before seen in Baghdad: a passenger lift. Another remarkable attribute in a land where bargaining for goods had always been taken for granted was that haggling over prices was banned. Branding, 19th-century style. Origin of logo unknown. But what was Orosdi Back and where did that strange name come from? 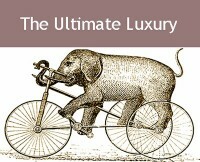 The middle of the 19th century was boom time for the Western world’s entrepreneurs and merchants of vision. In 1856 London, Charles Henry Harrod had been running his successful enterprise for 15 years before moving that year to premises in Knightsbridge, the site of the store even now. In 1856 New York on the other hand, Joseph and Lyman Bloomingdale were five years away from starting their business, selling hoop skirts on Manhattan’s Lower East Side. But in 1856 Europe, over on the continent two Austro-Hungarian Jews with a store in Vienna, Leon Orosdi and Hermann Back, were setting their sights on the Ottoman Empire and the rich prospect held out by the Middle East as a whole. The golden target was Egypt, where (they weren’t to know) around a quarter of a million foreigners were to settle between the time they launched their business in Cairo in 1856 and the 1940s. Among them were at least 65,000 Jews, with considerable purchasing power. It is almost as though the two entrepreneurs invented the term ‘globalisation.’ Within 30 years they had established branches in Bucharest, Plovdiv, Salonica, Izmir, Aleppo, Beirut, and Tunis, working mainly the wholesale trade with buying offices in a host of industrial cities in Western and Central Europe — and amazingly, even in Japan. The move into Iraq came later, after the First World War, with a store in Basra as well as Baghdad, by which time their retail network was enormous. While the Baghdad store disappeared, the one in Cairo is still open today, albeit nationalised by Nasser, and bears the name ‘Omar Effendi’. The six-story rococo building opened in 1909; in its better days when it was still a private-sector company the globe above it was seen miles away as it shone its powerful beam each night, beckoning wide-eyed patrons. 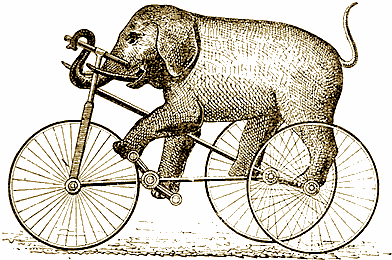 Orosdi Back was registered as a French company, with a bizarre trademark of an elephant riding a tricycle. It is still in business today as Orosdi, based in Paris, listing as its principal activities the purchase, sale, import and export of novelty goods, textiles, costume jewellery, perfume and related products. The company owns shops in France as well as in Burma. US combat forces have now withdrawn from Iraq and from all accounts it seems the battle for winning the hearts and minds of the Iraqi people has been a lost cause. How much this little guide could have been helpful in swaying the issue is debatable. Its advice dates from 1943. 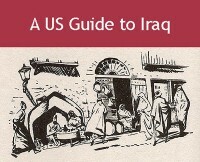 The Guide was first published in Washington DC and has now been re-published in facsimile format*. Its tone is down-home folksy, the job of the American soldier being to win trust and friendship by deploying the best weapon in his arsenal: what the author calls ‘plain common horse sense.’ That seems to have been in short supply these past few years, and I make no apology for reproducing extracts here, necessarily abbreviated. I do so with the best intentions and hope I don’t infringe any copyright (the Pentagon has my address). Probably you will feel that Iraq, first-hand, means heat. Blazing heat. And dust. In the daytime Iraq can be one of the hottest spots in the world… Or maybe the first thing you will notice will be the smells. You have heard and read a lot about the ‘mysterious East.’ You have seen moving pictures about the colourful life of the deserts and the bazaars. When you actually get there you will look in vain for some of the things you have been led to expect. You will smell and feel a lot of things the movies didn’t warn you about. But don’t get discouraged. Most Americans and Europeans who have gone to Iraq didn’t like it at first. Might as well be frank about it. They thought it a harsh, hot, parched, dusty, and inhospitable land. But nearly all of these same people changed their minds after a few days or weeks, and largely on account of the Iraqi people they began to meet. So will you. That tall man in the flowing robe you are going to see soon, with the whiskers and the long hair, is a first-class fighting man, highly skilled in guerilla warfare. Few fighters in any country, in fact, excel him in that kind of situation. If he is your friend, he can be a staunch and valuable ally. If he should happen to be your enemy lookout! There are a few Christians and Jews and other sects among the Iraqis, but by far the most people you will meet and see are Moslems… The Moslem bible is known as the Koran and the Moslems worship in mosques (mosks). They are very devout in their religion and do not like to have ‘unbelievers’ (to them you are an ‘unbeliever’) come anywhere near their mosques. You can usually tell a mosque by its high tower. Keep away from mosques. Even though you may have visited mosques in Syria or Egypt, the mosques in Iraq must not be entered. If you try to enter one you will be thrown out, probably with a severe beating. The Iraqi Moslems even resent unbelievers coming close to mosques. If you have blundered too near a mosque, get away in a hurry before trouble starts… Don’t stare at anyone who is praying, and above all do not make fun of him. Respect his religion as he will respect yours. Moslems pay much attention to good manners. Handshaking in Iraq is considered an important part of good manners… but do not touch or handle an Iraqi in any other way. Do your swearing in English. Avoid the native oaths; you will not know their exact meaning and they may get you into trouble. Do not urinate in their presence. They do it squatting and dislike to see other people do it standing up. These things may seen trivial, but they are important if you want to get along well with the Iraqis. Never make advances to Moslem women or try to attract their attention in the streets or other public places. Do not loiter near them when they are shopping. If a woman has occasion to lift her veil while shopping, do not stare or smile at her. Look the other way… Any advance on your part will mean trouble and plenty of it. Even when speaking to Iraqi men, no mention should be made of their female relatives. To repeat – don’t make a pass at any Moslem woman or there will be trouble. Anyway, it won’t get you anywhere. Prostitutes do not walk the streets but live in special quarters of the cities. • Remember the fear of the ‘evil eye’. Don’t stare at anyone. Don’t point your camera in anyone’s face. • Avoid offering opinions on internal politics. Remember that the Iraqis are a very modest people and avoid any exposure of the body in their presence. • Start eating only after your host has begun. • Eat with your right hand – never with your left, even if you are a southpaw. • In the city eat only part of the first course. There may be more coming. In the country leave some food in the bowl – what you leave goes to the women and children. • Don’t offer Moslems alcoholic drinks. Drink liquor somewhere else – never in the presence of Moslems. • In a house or tent, follow the rule of your host. If he takes off his shoes on entering, do the same. • If you are required to sit on the floor in an Iraqi house or tent, cross your legs while doing so. When visiting, don’t overstay your welcome. The third glass of tea or coffee is the signal to leave unless you are quartered there. • If you should see grown men walking hand in hand, ignore it. They are not ‘queer’. • Show respect toward all older persons. Be polite. Be hospitable. Be generous with your cigarettes. • Above all, use common sense on all occasions. And remember that every American soldier is an unofficial ambassador of good will. The rate of exchange of Iraqi money to United States currency may vary a little from time to time, so that the table below can give only approximate ratios. The basis of Iraqi money is the ‘dinar’ (DEE-NAHR) which is roughly worth $4.00 in United States money. Well, the value of the dinar certainly varied, as did the appearance of Iraqi banknotes. Off with his head: The Saddam currency (Old Iraqi Dinar) was introduced after the last Gulf War, to be replaced by the New Iraqi Dinar in October 2003 in banknote denominations of 5,000, 10,000, and 25,000. Sixty-six years ago, one US dollar was worth 250 fils (a quarter of a dinar); today $1.00 = 1,194 dinars. * The Guide has been reprinted in facsimile by Dark Horse Publications, 2008. ISBN 978-0-9556221-0-6. £4.99/$10.00. As a child growing up in Baghdad in the1930s,I recall the name “Orosdibag” -my memory ‘corrects ‘ the last letter from ‘k’ to ‘g’ ! I also recall “Mukhzan Baghdad”,a sort of Department store specialising in sweets and chocolate,particularly “Nestle”. The store was owned by Shaoul Darwish,who married Violette Kehela,my cousin. Saturdaynight was poker night,when he used to come to our house with a large bar of ‘Nestle’ chocolate,and there was a poker school with father,and uncles. I was a page boy at Violette’s wedding. She is in her 80s,widowed,and lives in Florida. She was still not out of her teens when she married,and we still communicate by email. You met her younger sister Amy and myself at your book opening in London and we treasure the books you autographed for us that night!